The Stevie Awards for Great Employers announced Jive and other winners at a September 22 ceremony in New York. We're thrilled to receive The Stevie Award for Employer of the Year. Our employees mean the world to us. 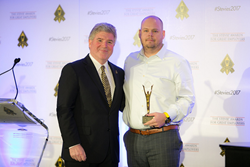 Jive Communications has been named the Gold Stevie Award winner in Telecommunications at the second annual Stevie Awards for Great Employers. The Stevie Awards recognize the world’s best employers, along with the human resources professionals, teams, achievements, and HR-related products and suppliers who create and maintain great places to work. This year, the Stevie Awards considered more than 500 nominees, and more than 50 professionals worldwide participated in the judging process to select this year's finalists. Other award winners included Samsung, IBM, McAfee, Cisco, and Wayfair, among others, and an awards gala was held in New York City in their honor. Paul Thatcher, VP of Human Resources at Jive, said, "We're thrilled to receive The Stevie Award for Employer of the Year. Our employees mean the world to us. They’re the reason we've come so far and made such great strides in the VoIP industry. We have big hopes and plans for the future of Jive and the Jive team." Stevie Awards are conferred in seven programs: the Asia-Pacific Stevie Awards, the German Stevie Awards, The American Business Awards, The International Business Awards, the Stevie Awards for Women in Business, the Stevie Awards for Great Employers, and the Stevie Awards for Sales & Customer Service. The Stevie Awards competitions receive more than 10,000 entries each year from organizations in more than 60 nations. Honoring the people behind organizations of all sizes, the Stevies recognize outstanding performances in the workplace worldwide. Learn more about the Stevie Awards at http://www.StevieAwards.com.